This post could also be called “Beyond Pepper.” No matter where you go, this is the one spice that adorns almost all tables, from homes to cafeterias to fine restaurants: pepper. I used to take for granted the fact that we settled on this one tabletop choice for all of our self-seasoning needs, but dining with my Persian friends (who always keep a shaker full of sumac next to the pepper) got me thinking that it might be nice to have more options. I decided to take my own standard table setup a little further. At the beginning of each season, I open up my herb cabinet and mix together half a dozen herbal sprinkle mixtures to use during the coming months. I make sure to have savory sprinkles for salad dressings and marinades, several sweet and aromatic blends that I use lavishly in breakfast foods and treats, and then a couple mixtures that contain specific herbs that I want to work into my diet during that season. We regularly keep about seven shakers of herbs on the table at any given time. In my house, we started putting herbal sprinkles on a lazy susan for easy seasoning access during meals. It was a hit, and now that lazy susan full of various herbal sprinkles, is a permanent fixture on our kitchen table. Hundreds of people have told me that putting the herbal sprinkles in the dining area has been the single best move for activating interest in herbs among their family members. The possibilities for herbal sprinkle combinations are endless! 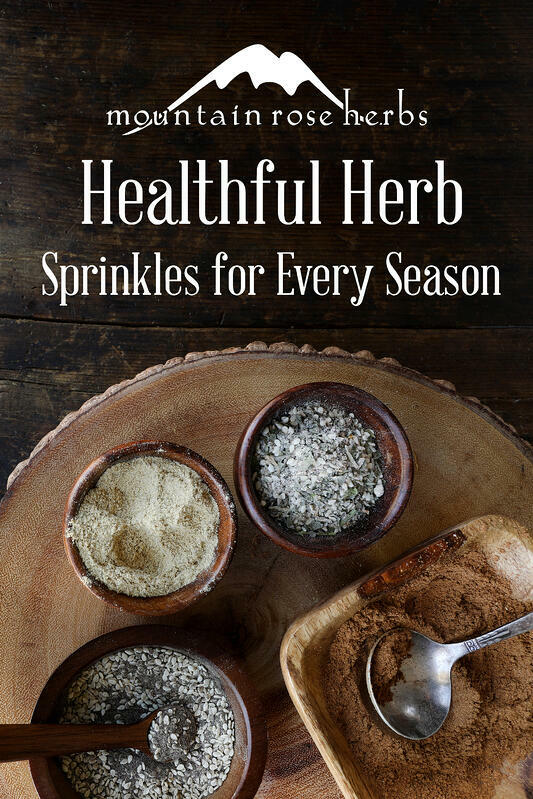 I have an entire chapter on herbal sprinkles in my book, The Herbal Kitchen! 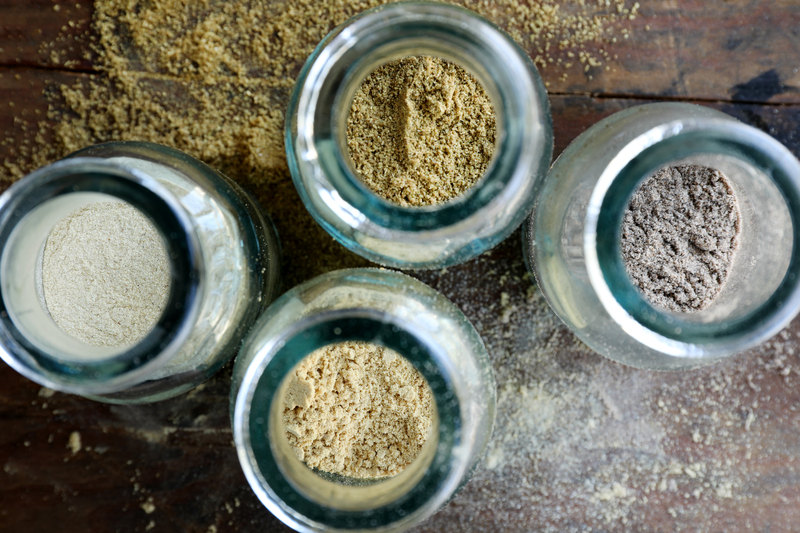 But to get you started, here are four popular seasonal herbal sprinkles that I think you will enjoy! Choose your dried herbs and spices. Mix powdered or hand ground herbs together well in a bowl. Put into a salt shaker. Sprinkle on your food. Easy! As winter’s ice begins to thaw and the water starts moving again, the same thing happens in the body. 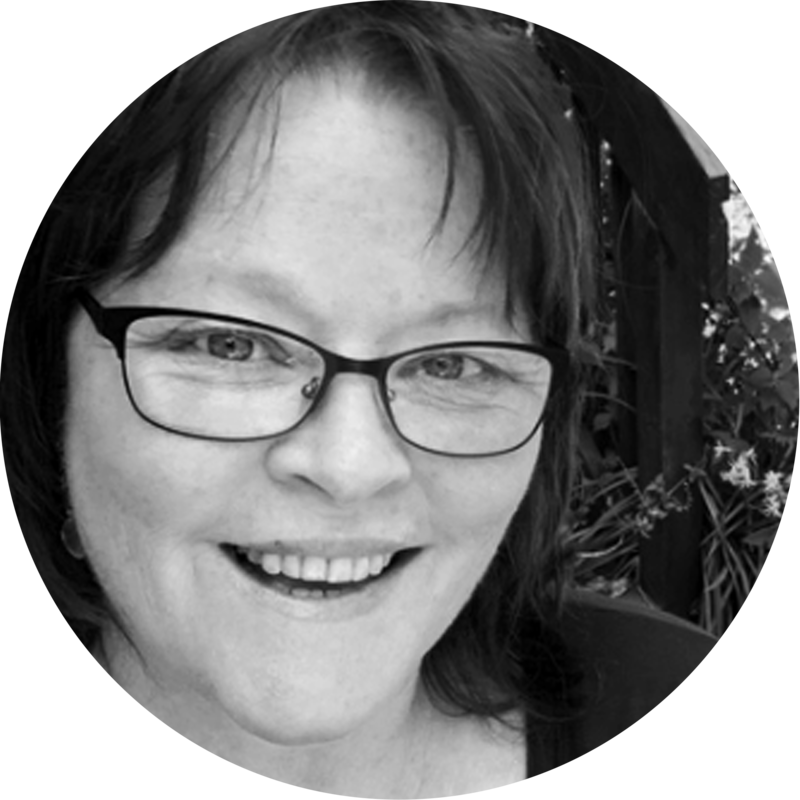 Spring is the time to shed the layers of winter and lighten up a little. Take care of your liver and everything moves with more ease. This liver support mixture is a nice addition to smoothies, salad dressings, and soups. Sometimes the herbal mixing experiment just works and you hit a flavor jackpot! The combination of these four ingredients is nothing less than absolutely delicious. The sesame seeds absorb the intensity of the seaweed, and the pepper and chives add a pungent note that enhances any salad or leafy green dish. I make a quart of this sprinkle and can hardly keep the salt shaker filled. This is one of the most popular sprinkles from The Herbal Kitchen. How can only four ingredients be so yummy? Use this blend to liven up any summer salad, or with rice, eggs, potatoes, or quinoa. This sprinkle can easily be added to drinks and smoothies. That is the great thing about sprinkles—if you have family members that aren’t quite as passionate as you are about getting their daily dose of herbs, sprinkles can be slipped in here and there without anyone even knowing! This blend is a good addition to recipes that call for flour: pie crust, muffins, dumplings, cookies, and corn bread. Just add some of the sprinkle to the flour when making the batter. We also sprinkle this on fruit snacks, apple sauce, and desserts. As the days grow colder and darker, and we crave more insulating foods, it helps to have a carminative at every meal. This combination of carminative spices helps you digest your food and is an especially useful digestive aid for the heavier fare of winter holiday feasts. 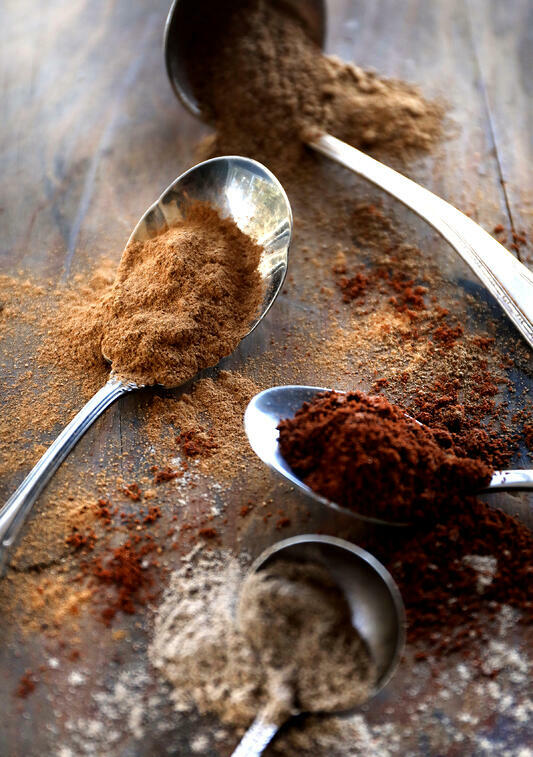 This spice blend is good on French toast, muffins, scones, bagels, pancakes, and oatmeal—that’s why we call it Breakfast Sprinkle! Since it tends to be a people-pleaser, I like to make up big batches and give it away as gifts. 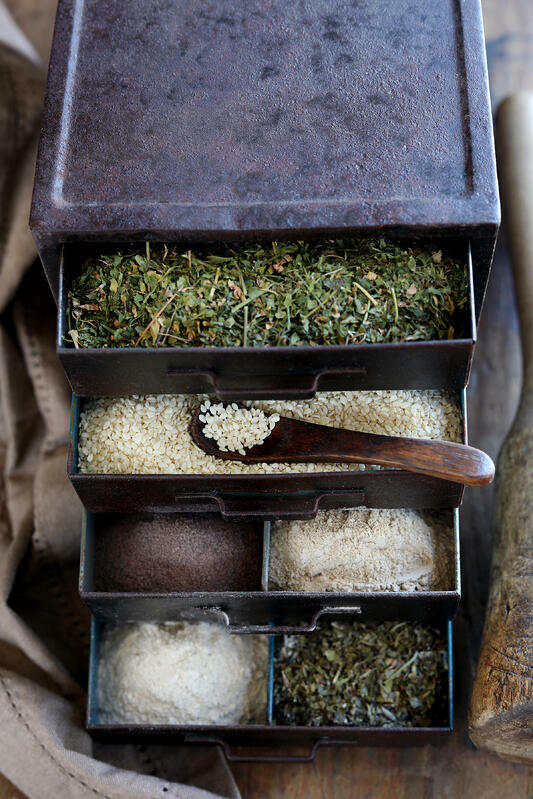 Our kitchen herbs are abundant in their healthful gifts and nutritional benefits. These herbal sprinkle mixtures bring the best qualities of your spice cabinet to the center of your daily culinary experience. 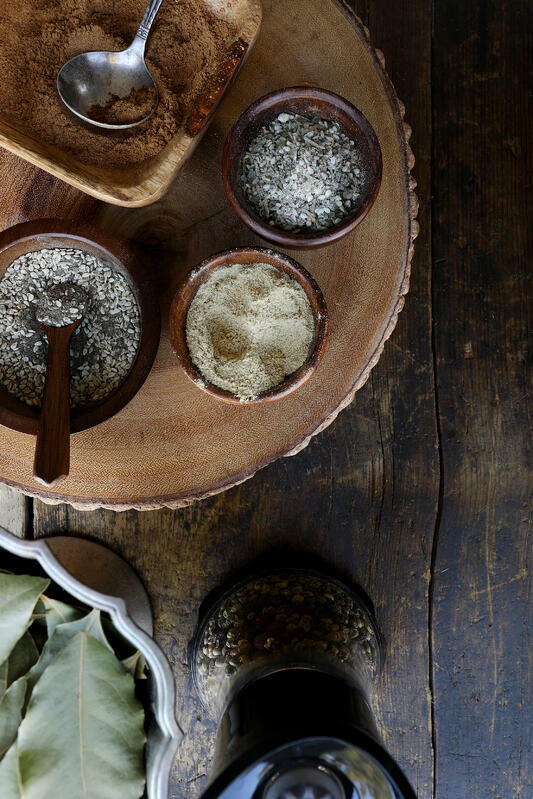 Enjoy this wonderfully creative and delicious journey of filling your herbal kitchen with delicious, nutritious, and digestion-supporting herbal sprinkles. 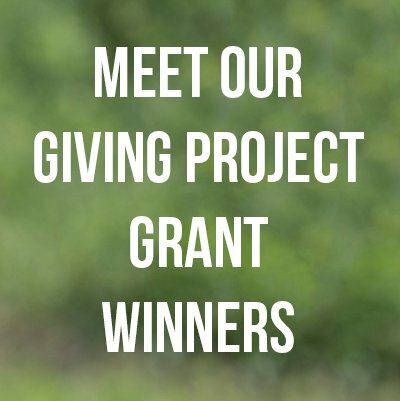 Interested in exploring Other spice blends? Try These 3 Seasoning Blends from Around the World!